If you are someone who fancy Android a lot and want to extend the Android experience to your PC or may be you want to play android games on your PC, either reason, there is a good nenws for you. There is this app called AMI DuOS that will help you to extend your Android experience to PC. It runs Android on top of Windows as though it was just another application. It has the promise of silky smooth performance. AMI stands for American Megatrends Incorporated. It has been producing hardware and software for the PC industry since 1985. It’s best known for BIOS firmware and there’s a good chance you’ve seen the name pop up as your desktop runs through its start up routine. DuOS was originally developed in partnership with a manufacturer, but the deal fell through and AMI decided to release the software direct to consumers. I first tried it on a Surface tablet at MWC where it ran impressively smoothly. It offers the ability to run Android in a window that can be resized or minimized, and it can run the vast majority of the operating system’s apps and games. Here are the minimum requirement your computer must meet before you will be able to run the application. 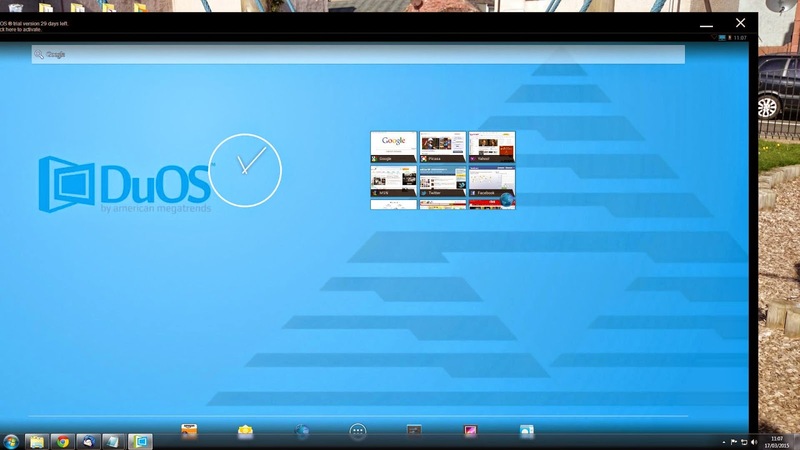 The DuOS app from AMI runs just like any other PC application. Run it as you would for other windows applications. Note however that, DuOS works best with touchscreen devices because Android is designed for touch control, but you can use a mouse or a touchpad. AMI has provided a number of keyboard shortcuts to help you rotate, zoom, swipe, and tilt. There is limited gamepad support. DuOS runs Android 4.2.2. It features all the functions on Android devices. You can customize the desktop, there’s a standard app drawer, and you can pull down the notification shade from the top. 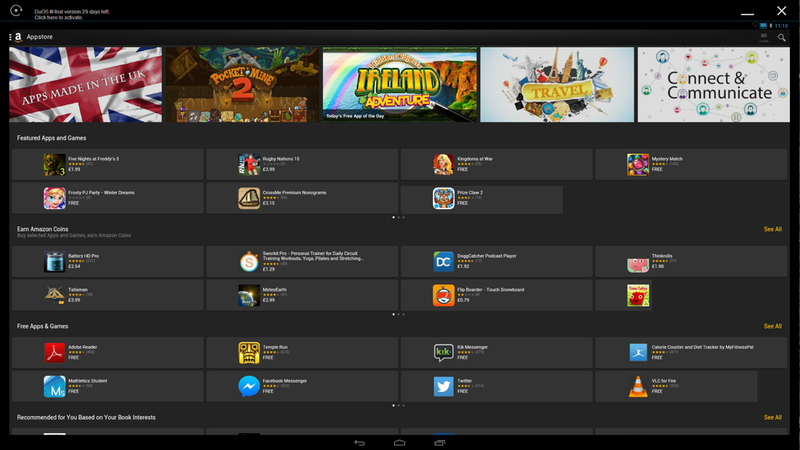 All the usual settings you’d find on an Android tablet are there. If you have a microphone connected you can even use Google Now voice search or commands just as you would with an Android device. AMI also includes a configuration tool in settings that lets you set up folders that can be shared between Windows and the DuOS app. That means you can access the same music, videos, pictures, and documents on both. There’s also an optional root mode for super user control. You can even set the amount of RAM that’s available to DuOS to prevent it from monopolizing system resources. Performance-wise, AMI's DuOS runs sufficiently smooth provided your PC meets the minimum system requirement. It runs games with high graphics smoothly and flawlessly. This is the best Android virtual machine that you can ever get. The app allows you to try for 30 days after which you have to pay for a one-off fee of $10 if you want to continue using. AMI would probably tempt more consumers if the installation process was more user friendly, but once installed DuOS is robust and very easy to use.